"We have a certain amount of control authority during entry, descent, and landing—that is, the ability to steer." Putnam said. "Hypersonically, the vehicle can use lift to steer. Once the descent engines are ignited, the engines have a certain amount of propellant. You can fire engines in such a way that you land very accurately, you can forget about accuracy and use it all to land the largest spacecraft possible, or you can find a balance in between. "To maximize the amount of mass we can landing on the surface, the altitude at which you ignite your descent engines is important, but also the angle your velocity vector makes with the horizon—how steep you're coming in," Putnam said. The study, "Entry Trajectory Options for High Ballistic Coefficient Vehicles at Mars," was authored by Christopher G. Lorenz and Zachary R. Putnam. It appears in the Journal of Spacecraft and Rockets. The space shuttle weighed 165,000 pounds empty. Adapting the principle of a guided glide for most of the trip to the surface of a planet with no landing strip and then using retropropulsion to steer and land vertically will be the most practical system that I can think of. Current landing models still use some form of atmospheric braking, so it cannot be ruled out on the basis of there being virtually no atmosphere. Didn't we already make the space shuttle? Ceramic tiles and wings in order to use air-resistance as drag and lift? I suspect this is basically a psychological problem. Nobody is willing to risk their career taking the blame for failure. Not the corporate bureaucrats, not the congresscritters, not the NASA administrators. When an expensive, complex machine, with Human crew, failed because of the O-rings became brittle? I think that took a lot of the heart out of the decision-makers. Maybe Musk &/or Brandon will at least partially succeed. Enough to keep an American contribution to Space exploration going. However, any failure, which will be defined by the Public as the deaths of either or both men or celebrity passengers? Will shatter the happy illusion of technological superiority. "That if you can dream it? Sending the markets in a wild panic to avoid financial liability. What's missing out of all this hoopla is greed. What profit is to be gained accepting the risks & the costs of failure? What is this quarter's ROI for going to Mars? quite true. But, until you have an alternative, do you have an alternative? Project Orion. 10,000 TONS lifting capacity, able to deposit it on the Moon, or Mars. Enough to build an entire colony space in one shot. Too bad that dead political animal Kennedy killed it in favour of Apollo. Yeah, they landed on the moon, but chemical rockets are done and are absolutely not fit to make it to Mars. ""Turns out, it is propellant-optimal to enter the atmosphere with the lift vector pointed down so the vehicle is diving. Then at just the right moment based on time or velocity, switch to lift up, so the vehicle pulls out and flies along at low altitude," Putnam said." To respond to the comments, they can be grouped in two categories, getting there and do martian entry, decent, landing. 1) "archaic form of propulsion", "Orion". 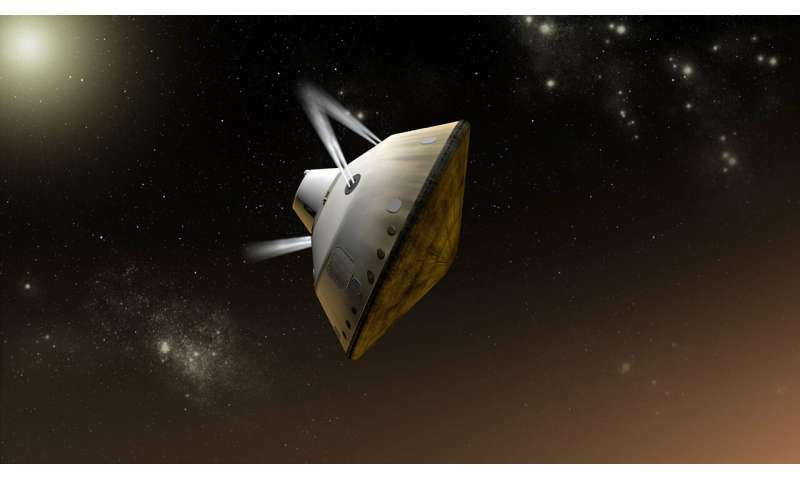 There are no current developed alternatives and despite comments they are the only ones that make it to Mars, though effective ion propulsion is tested for slow but massive cargo. Do we throw out cooking or internet just because they are archaic techniques? Nuclear all the way (Orion) is impossible because of start on Earth. Be how it may, projected Mars crafts for the next decades are chemical, obviously. 2) "Shuttle ... tiles and wings". The differences between Shuttle for dense atmospheres (where wings are useful) and Mars thin ones (which mostly reminds of Apollo high altitude skip returns) are too numerous to go through; there are special sites that do this. Something like Shuttle cannot do Mars EDL since it is too dependent on aerodynamic surfaces (despite being more of a falling brick) yet cannot brake in time; and of course US likely cannot remake Shuttles *now*, production technology is lost. Tiles do not protect against interplanetary entry heat loads, which are 10 times the Shuttle LEO returns heat loads. C.f. Starship. SpaceX does away with the ballistic problems, the supersonic retrorocket fuel mass and the heavy passive heat shields by making a sideways skydiver descent and actively cooled skin areas (whch will use up 10 mt of methane instead of having tens of tons of tiles). chemical rockets are done and are absolutely not fit to make it to Mars. What on Earth are you smoking? Obviously, chemical rockets aren't done. Chemical rockets are going to be the only way going forward until quantum rockets or something crazy comes out. Nuclear rockets are not a safer or better option and they wouldn't be powerful enough to land a huge spacecraft on Mars anyway. Back to the psychological aggravation. People lack the patience for slow & methodical. One slow option without the need to develop unproven technologies, is a robot RO/RO bus. Doing the gravity roller-coaster around Luna to around Earth to around the pair of Earth & Luna to be flung at Mars. Using the time enroute to be bleed off acceleration with the Sun's gravitational attraction. Once rendezvous with Mars is achieved? The RO/RO bus uses Mars gravitational pull to achieve a stable orbit, from which the bus drops off the robot probes. That slowly loose any remaining momentum being pulled in by Mars gravity. This should simplify the probes landing risks. I just thought. Some of the probes should not land but remain flying at low altitude recon. & that some of the lander probes should be held back in reserve. If preceding probes found anything really interesting? The reserves could be landed in the same region for in-depth prospecting. No, the shuttle concept is sound, with appropriate modifications for a thinner atmosphere and greater velocity, even if that involves some rocketry to reduce the velocity. The reason the planners want to start from scratch is much more banal. The shuttle was reusable. This is going to be a one way trip. Why not build small modular systems that can be assembled on the planet. This would reduce your loss, should something go wrong. For example, send a light, barebones rover and its tools as separate payloads.